The general connection setup is the same across most if not all FTP clients, but we recommend FileZilla in general so the guide will focus mostly on this. 2. Install it then start it up. 6. Click on Connect and you will see a pop up regarding a security certificate. Simply click OK to accept it - this will ensure that file transfers to your server are secure and encrypted. You should be able to upload/download and modify files as necessary after this point. FileZilla is very simple and easy to figure out. Once connected to your server there will be two windows in your program. The left window dictates the files on your computer and the right window shows files in your server. To upload files to your game server directory, just browse for the files in the left window, right click on it and hit upload! You can even drag files directly from your desktop or folders onto FileZilla itself. If you do not see a plugins folder, that means you are running Vanilla Minecraft and not CraftBukkit, or have not refreshed the FTP since loading it up on CraftBukkit. You can switch to CraftBukkit using the JAR selection menu in Multicraft. 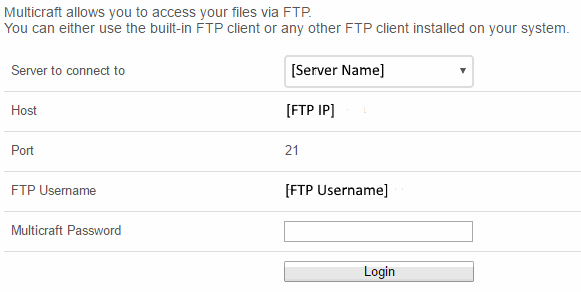 Find the "FTP" section. It should be under "Environment"
Find the entry that says "Force IP address for passive mode connections:"
Change it from "Auto" to "On"